Miss Saavedra, the principal of Hamilton High School looked anxiously at her watch as the last group of students rushed up the stairs in an effort to make it to class on time. She had been making her regular rounds since early morning to make sure everything was running smoothly; teachers monitoring students as they gathered their materials from their lockers and students moving quickly to their classrooms in order to begin first period. Normally she was more relaxed, but today she was particularly anxious because she had invited a group of colleagues to visit her school to conduct a targeted learning walk. In the past, school walkthroughs were conducted once a year by a supervisor for the sole purpose of fulfilling the principal evaluation requirement. Mr. Lopez, Miss Saavedra’s Central Office supervisor, would quickly walk through the building carrying a checklist with items that focused mainly on cleanliness, student discipline, and budget. The visit would end with a quick review of the school test scores and graduation rates, and a discussion about any parent complaints that had reached the superintendent’s office. These visits often left her perplexed because they did not provide her with the opportunity to explore possible solutions to challenges she was facing in her school nor was she left with a clear idea about what her next steps towards improvement should be or what type of support to expect from the central office. The walkthroughs from her past were negative experiences with little added value. Miss Saavedra’s TLC coach had assured her that the targeted learning walk would be different. Promptly at 8:00 a.m. her thoughts were interrupted by a call in her walkie – talkie. Her administrative assistant was letting her know that the visitors had arrived and were being escorted to the library where they would be meeting with her and members of her staff to discuss the purpose of the targeted learning walk and begin the process. Visits to classrooms have been a common practice in most schools and school systems since the beginning of public education. Today these visits, often referred to as walkthroughs, differ in purpose and nature from most of the visits of old – they are focused on instruction, instead of structure. Walkthroughs are designed to be dynamic and meaningful to a school site or staff, and to help drive instructional improvement, not an item to be checked off on a supervisor’s to do list. This issue of the On Target Report sheds light on TLC’s highly successful walkthrough process called “Targeted Learning Walks”. 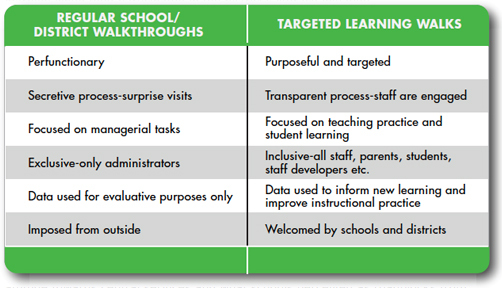 What is the difference between regular school/district walkthroughs and Targeted Learning Walks? Many school and classroom walkthroughs are perfunctory or solely used as a means for conducting formal principal or teacher evaluations. Too many central office supervisors and principals continue to walk through classrooms and school hallways checking to make sure students are on task, regardless of the quality of the assignments they have been given or the rigor of the work they are producing. In many districts and schools, administrators are often the only leaders who engage in the practice of visiting schools and classrooms. The mandated evaluation tool is often the only tool used during these visits and is rarely seen as a means for professional growth aimed at helping individuals or schools improve. Targeted Learning Walks are purposeful and data driven. They are specific about “what to look for” and help school or district teams identify “next steps” once the process is over. Targeted Learning Walks are focused on the teaching and learning agenda as a means for ongoing improvement not solely evaluation, and serve as tools for gathering evidence of how well instructional improvement efforts are being implemented in classrooms across a school or district. Compared to many other walkthroughs, targeted learning walks are transparent to all involved in the process, become embedded in the school and district culture, and are considered an important factor in helping leaders and staff improve their practice and increase student achievement results. They are often conducted by a combination of external and on-site administrators and teaching staff and in many cases include parents, students, and paraprofessionals. This same process is a powerful tool when used by school instructional leadership teams, as well. How does TLC define the Targeted Learning Walk? TLC defines the Targeted Learning Walk as an organized visit through a school’s classrooms and halls to collect evidence about how well school improvement efforts such as: school and/or district selected instructional practices and processes are being implemented school-wide and how the implementation of these practices and processes is impacting student achievement results. How does a school organize for a successful Targeted Learning Walk? The success of any learning walk depends on how well the instructional leadership team of the school organizes and prepares the school community for the process. In order for a staff to fully benefit from the feedback after the learning walk, trust must be built by making the process transparent. Effective administrators and leadership teams engage the entire staff in identifying the purpose for the learning walk and clearly articulate what evidence the learning walk team will be charged with gathering. The objective is not to catch people doing the “wrong things” but to highlight promising practices, challenges in implementation of those practices, and make suggestions for improvement. Each step of the process must be carefully planned and communicated to the staff so that everyone knows what to expect and there are no surprises. Communication is key during the targeted learning walk planning stage. During this stage, the leadership team of the school must inform the staff about all logistical details of the targeted learning walk such as: how many classrooms will be visited, who the members of the visiting team will be, how long they will remain in the classrooms, and how and when the evidence and feedback from the learning walk will be shared with all members of the school community. Additionally, it is imperative that the leadership team guide the staff in identifying the purpose of the learning walk – the specific instructional strategies, behaviors and processes that they want the visiting team to look for evidence of (implementation) in every classroom. Following are some guiding questions that school and district leadership teams must be prepared to address, prior to the targeted learning walk, in order to ensure that the process is transparent and the evidence collected by the visiting team is meaningful and provides helpful feedback for improvement. What is the purpose of our targeted learning walk? What specific strategies do we need the visiting team to look for? Who from our staff will participate in the targeted learning walk along with the visiting team? Where will it take place? Which classrooms will be visited? Will all the classrooms be involved? What evidence gathering tools (learning walk protocol) will the visiting team use? As important as the pre-targeted learning walk planning stage is to the success of this process, it is also critical that the visiting team identify a common and consistent protocol to use during the targeted learning walk. A common protocol ensures that all members of the team follow the same process when gathering evidence and remain focused on the purpose identified by the school. The visiting team may need to divide into several smaller groups of 4 or 5 so as not to overwhelm the classroom. Have the student interviewer talk to 3-4 students. Sample questions: What are you learning or solving? Why is it important that you learn or solve this? How do you know what good work looks like? Is this work challenging for you? Would you please read a short section of this assignment for me? Take 5 minutes in the hallway after visiting each classroom to discuss, as a team, the evidence and wonderings gathered – Ensure that the designated recorder keeps clear notes from the discussion prior to visiting the next classroom. Once the learning walk is over, the visiting team will need 30-60 minutes to convene in a quiet location in order to review all of their notes and discuss the evidence statements and wonderings. This discussion will help the team craft the feedback report that will be presented to the staff and/or leadership team of the school that received the visit. This process, which takes place after the targeted learning walk, needs to engage all members of the visiting team (including staff from the school who were members of the visiting team during the learning walk). The feedback report does not contain a laundry list of detailed statements about every piece of evidence or wonderings that the team collected. Rather, it contains thoughtful, targeted statements (no more than 4-8 evidence statements, 4-5 wonderings, and 4-5 suggestions) based on specific evidence observed during the learning walk. In crafting this report, the team will look for common themes and trends as well as provide specific examples to support each theme or trend identified in the report. What are the 4-5 specific wondering statements (areas of weakness or challenge) that we can make based on evidence related to what the school asked us to look for? What 4-5 suggestions can we offer this staff in order to help them improve their work and deepen their knowledge and understanding of the strategies they are trying to implement school wide? Using chart paper, the facilitator charts the 4-8 evidence statements made by the group, followed by a second chart containing the 4-5 wondering statements. Once the evidence and wondering statements are charted, the group draws upon each member’s expertise and experience to craft the 4-5 suggestion statements and next steps. Who will need to hear and see the feedback report? Will there be opportunity for the school community to ask clarifying questions and discuss the report? Who, from our team, will share the report and facilitate the discussion with the school community? How soon can the feedback report be shared? What are the next steps for implementing the suggestions listed in the feedback report? How will the leadership team be involved in this process? The staff? What support will the leadership team need (from the principal, central office, staff developers, consultants, coaches…) to implement the suggestions and next steps? Schools and districts engaged in this process report that it has helped them change the culture in their schools from one of distrust and isolation to one of collaboration and openness. One of the reasons why this culture change happens quickly in schools and districts implementing targeted learning walks is that the external colleagues do not come into the building with their own agenda for what needs to change or with a punitive mindset. The leadership team and staff from the school or district hosting the targeted learning walk identify the purpose of the visit and the strategies the visiting team will be looking for. This forces school teams to analyze their data carefully, identify promising strategies, and engage the staff in professional learning around these strategies prior to engaging a visiting team in a targeted learning walk. The “talk” in the hosting school or district changes from “Look what they are going to do to us” to “look at what we have asked the visiting team to do for us”. There is also an expectation that the school’s instructional leadership team will continue to conduct it’s own internal targeted learning walks each month to track how the recommendations are being implemented. Finally, once the process is over, school and district staff is left with a product – the feedback report – that offers clear and concrete evidence about where the school is in the implementation of their promising strategies, and provides realistic, and specific next steps and suggestions that will help the school improve teacher practice and increase student achievement results. Amalia Cudeiro, Ed.D. Co-founder and partner with Targeted Leadership Consulting, Dr. Cudeiro was most recently one of five deputy superintendents for the Boston Public Schools, where her primary responsibilities included recruitment, selection, training, professional development, supervision, and evaluation of principals, headmasters, directors, and cluster leaders. During her tenure in the Boston Public Schools, Dr. Cudeiro was instrumental in the development and implementation of the school district’s Principal Evaluation and Accountability Process. Dr. Cudeiro served for many years as a principal in California public school systems, in the Santa Monica and Baldwin Park school districts. She has also been a Master Practitioner at UCLA. Later, she was one of only eight selected nationally for a fellowship to complete her doctorate in the Urban Superintendent Program at Harvard University, where for the past four years she has served as Adjunct Professor. Jeff Nelsen, Ph.D. Co-founder and partner with Targeted Leadership Consulting and former co-director of the New England School Management Program in Boston, Dr. Nelsen has provided training and coaching to more than 2,000 principals and school leadership teams over the past decade, helping schools set and meet rigorous, measurable student learning goals. Previously, Dr. Nelsen was a teacher and principal for 21 years in California. The last school he directed received both state and national recognition for its dramatic increase in student performance. With his Ph.D. in organization and policy studies, Dr. Nelsen has taught graduate students at several universities over the years, and is the former director of the Harvard/ACSA Principals Institute at the University of California-Los Angeles.